Each month Anglicans for Life publishes a Lectionary Life App that includes reflections on the Sunday Lectionary readings that focus on the Sanctity of Life. For July, I wrote reflections for each Sunday. They are published below. You can sign up to receive the Lectionary Life App each month here. As a seminarian, I learned immediately from Dr. Erika Moore, my Old Testament professor, that “context is king.” And as with my own preaching and teaching, I’m sure that lesson reverberates in your ministry of the word. Each passage of Scripture we interpret has a literary, historical and theological context in which it has been weaved by its author. The context shines a light on the meaning and message of any text. Each young woman who considers abortion has a relational, familial, spiritual and cultural context in which she lives that informs this seminal decision to keep or abort her child. Similarly, each person and family facing end-of-life care decisions has a context for their hopes and fears. Folks don’t come to these crisis-decisions in a vacuum, and I think God has placed pastors in positions to inform the larger context of people’s lives with a value on the sanctity of life. A foundational building block of that context of life is inviting God’s presence and guidance in all stages of life and all of our relationships. The hand of God in the marriage of Isaac and Rebekah illustrates his thoughtfulness and passion for family and bringing a man and woman together for love, comfort and life. We know in the Biblical stories that things are rarely sunshine and lollipops, but here is a moment of God revealing himself in initiating the marriage bond. It gives Isaac comfort after saying “Goodbye” to his mother Sarah. The event of their union in marriage exists in the larger context of God’s story of redemption. This recognition of God’s hand in life is such a contrast to the circumstances that bring mothers to have abortions. Abortion rejects the reality of the role God plays in life. The same ignorance of God’s presence and eternal purpose leaves people in despair without comfort in the face of suffering and/or death. I believe that the peace and rest that Jesus gives comes not only from his presence in us but also from the relationships he develops between us and others in the family of God, especially our own families. It is among the context of our Christian brothers and sisters that we are guided by his gentle, easy yoke into comfort, rest, wisdom, strength and hopefulness. We promote the sanctity of life, as we promote relationships among believers. We create the context for life-affirming decisions, as we encourage our congregations to invite the Lord into every relationship and activity of our lives. This dynamic fuels a Christian imperative to continually invite the lonely and lost into this context of a loving Christian family that affirms life. Finally, the conclusion of this Sunday’s text from Paul’s letter to the Romans offers profound hope and promise for women and men who have chosen abortion and those suffering end-of-life challenges. He writes, “Wretched man that I am! Who will rescue me from this body of death? Thanks be to God through Jesus Christ our Lord!” (Romans 7:25a) No matter whether we have been doers of evil and/or victims of evil…Jesus Christ saves us, redeems us and gives us new life in him with the Father and the Holy Spirit. Amen! Rebekah responds by coming out of herself and inquiring of the Lord. The Lord reveals the truth of the twins, Esau and Jacob, and shares a vision of their lives. This prophetic insight from the Lord must have encouraged Rebekah with the awareness that God heard her cry and was aware of her plight. She must have been strengthened to know God was involved in her children’s lives already and would be in the future. Even in a person’s most trying, overwhelming moments, like when we face the consequences of a foolish decision or a terminal illness is diagnosed, the mind set on the Spirit will have “life and peace.” This mind of peace comes from the word God speaks to us. Scripture tells us that his word is life to us. He speaks peace to his people. For those who come to him in Christ, no matter from where, he accepts them, because, “There is no condemnation for those who are in Christ Jesus.” (Romans 8:1) What a great promise to offer those who feel like they have ruined their life or done something terrible. Let us always be praying that those who listen to our preaching, teaching or counseling will have soft, fertile hearts that will accept and guard God’s word, so that it will accomplish its purpose and produce a harvest of life and peace. The Lord confirms to Jacob the promises that he made to Jacob’s grandfather Abraham and his father Isaac, including the promise, “Know that I am with you and will keep you wherever you go.” Jacob has seen the vision of the stairway between heaven and earth and recognizes that God is present in that place. In the narrative of Jacob’s life, we will never see him abandoned by God, even though he later describes his life to Pharaoh, “Few and evil have been the days of the years of my life.” (Genesis 47:9) God continues to reveal his presence and providence in Jacob’s life. Jacob experienced an ongoing connection between heaven and earth. Paul informs us that the Holy Spirit and all of creation, including ourselves, groan for the coming of that time when evil is discharged from creation and all things are renewed for the glory of God. This glory will overshadow any hardships we have suffered during our pilgrimage on earth. In the meantime, we can have the assurance, as we go through any trials, that God is our “Abba, Father,” and he is with us to bring us into his kingdom. I think we, as preachers, have a calling and anointing from God to encourage people to have courageous faith that overcomes the fears that can rise up to undermine the sanctity of life. Too many members of our congregations are led by their fears and anxieties and a desire to avoid suffering rather than being led by the Holy Spirit. The same is true for us. I think it is important for us to demonstrate courage in challenging, even confronting, listeners about whom they follow—the Spirit of the Lord or fear. As we continue to read through Genesis, we come to the marriage of Jacob to Leah and then Rachel. Jacob loved Rachel, and the seven years working to have her went by quickly. When he awoke the morning after his wedding party, he found that he had consummated a marriage to Leah. That for which he longed and worked seemed to have been taken from him and replaced with something he didn’t want. An unexpected or unplanned pregnancy is often referred to as an “unwanted” pregnancy that is another way of saying “unwanted child” in the womb. The unwanted child may be something that threatens the desired path of the mother’s and/or father’s life. It may seem like a hindrance to reaching their dreams or having “their best life now.” Too often, the Western church’s message is that with God you can have your dreams and reach your goals and have all that you want. If that is how we interpret God’s mission in our lives, then fulfilling that can justify getting rid of something that hinders its attainment—like an “unwanted pregnancy” or a debilitated loved one. We see in the wonderful text of Romans that God’s goal is not making our dreams and wishes come true. His goal for our lives is that we become conformed to the image of his Son, our Lord, Jesus Christ. The image of Jesus Christ is self-sacrificial love. Through self-sacrificial love, God fulfills his purpose of making Jesus the “firstborn within a large family.” Therefore, God does not let anything stop him from loving people. He desires to love them into his family through the sacrifice of Jesus Christ and work of the Holy Spirit in people’s lives. Jacob accepted Leah as his wife, and then he received Rachel as his wife also. He had to work seven for years for Laban. Leah, the wife Jacob did not expect and did not want, gave Jacob six sons, including Judah from whose tribe Jesus was born. He received blessings of sons from both Leah and Rachel. An unplanned pregnancy that becomes an accepted and loved child can become the best blessing of a mother’s and family’s lives. God promises to be present “to help us in our weakness.” He gives the Holy Spirit to us, and Paul writes, “We know that all things work together for good for those who love God, who are called according to his purpose.” When we sacrifice our self-serving ambitions, dreams or treasures for the sake of loving and serving God and others, he will cause it to work for our good according to his purpose of conforming us to the image of Jesus. The gospel reading mixes metaphors for the kingdom of God that can also serve as analogies to babies conceived in the womb and growing. Like the kingdom of God, at conception a baby is the size of a mustard seed, and like the kingdom it grows to life and can become a blessing to those who love it. Jesus also compares the kingdom to a treasure in a field and a pearl of great price. When it is found, it becomes the greatest treasure of the one who values it. A child, planned or unplanned, can become a family’s greatest treasure—if accepted and loved, whether given for adoption for love’s sake or kept for love’s sake. God is present to help us with the greatest force in the universe—his unconquerable love. the unborn, the infirm and the elderly. according to Your will, through Christ our Lord. The command to baptize in the name of the Father, Son and Holy Spirit is not a mere formula to use in the Sacrament of baptism. 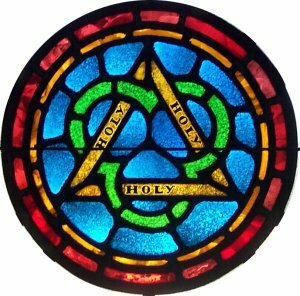 This reveals the presence of the Trinity in the life of the church. The term baptize comes from the Greek word baptizo meaning “to immerse.” Jesus commands his followers to go forth into the world and immerse people in the Triune God. Christians enter God’s kingdom and become his children, as they are filled and enveloped by the Father, Son and Holy Spirit. We are to experience God in his three persons. In his benediction in his second letter to the church at Corinth, Paul writes, “The grace of the Lord Jesus Christ and the love of God and the fellowship of the Holy Spirit be with you all.” (2 Corinthians 13:14) Paul blesses the church with grace from Jesus, love from the Father and Communion with the Holy Spirit. Christians don’t just need to know about the Holy Spirit, we need to experience the Trinity of God. It is important for us to understand that our God is one, “Hear, O Israel: The LORD our God, the LORD is one.” (Deuteronomy 6:4) Our God is one, and he is three persons. The early church came to understand God as “one substance” and “three persons.” God has called us into a relationship with him in his three persons. Jesus has been baptized by John, and as he comes up from the water, the Holy Spirit comes from heaven descending upon him like a dove. Then, the father speaks from heaven and affirms that Jesus is his beloved Son. Wow! The Trinity participated in Jesus’ life and ministry on earth. After the baptism, Jesus’ journey to the cross began with the first step not toward glory but testing in the wilderness. We also learn from the baptism that the Father loves the Son. This is an indication of the loving communion among the persons of the Trinity. We know that God is love. For love to exist as a being and an active, expressed substance, there must be a lover and a beloved along with the love that is expressed. What is communicated at the Baptism reveals God the Father—the Lover, God the Son—the Beloved and God the Holy Spirit—the Love given and received. Each is God, each is unique, each is one with the other who is in substance and quality the same. This triune God is fully sufficient in himself as three persons. He has no need. He didn’t and doesn’t need creation and people in order to have an object of love or an activity to occupy himself. He is fully sufficient in the loving fellowship of his being. I think the best answer to the question of “Why did God create us?” is that God has an abundance of loving goodness that overflows. He desires for more to love. God desires for the inclusion of creatures who can join in the communion of love with the Father, Son and Holy Spirit. What we see in the creation story of Genesis shows that God’s love must be defined as a love that is willing to suffer for more to love. To truly include a creature in the fellowship of the Godhead, that creature must be able to not only give and receive love but to also reject love. Love requires the freedom not to love. Therefore, to experience the loving inclusion of his creature, God had to be willing to suffer the rejection of his love and the consequences of continuing to love infinitely that creature. The creation of humans demonstrates God’s emphatic “Yes” to his willingness to suffer, so that the creature may experience inclusion in the divine love of the Trinity. Let’s look at the Genesis account of creation. When God created us in his image and likeness giving us dominion, he committed himself to suffering self-sacrificial love. Our freedom and dominion has led to history being a history of tragedy—the suffering of all creation and the suffering of God. History is also a demonstration of God’s commitment to eternal, self-giving love—the same love that has existed forever in the midst of the Trinity. Christians often desire and pursue experiencing God. I certainly want to experience God in my day-to-day life. I have come to realize that my natural tendency is wanting to filter the experience of God to him fitting into my life and blessing me in it. I think Christian maturity moves us from that way of thinking to pursuing entering into God’s experience of us. The grace of Jesus, love of God and the koinonia (fellowship, communion, sharing) of the Holy Spirit doesn’t just bring God into our life; it brings us into the life of God. Experiencing God entails entering into his experience of himself and his creation, including humans. That experience must entail the participation in God’s suffering, self-sacrificial love. According to the great theologian Jurgen Moltmann, God historically experiences humans in three ways of suffering. God suffers with people; he suffers from people; he suffers for people. To know God is to enter into and participate in his suffering. God began suffering with people when Adam and Eve rejected his love and followed their will in sin. God suffered with them, as he slayed an animal to cover their nakedness, as he declared the consequences over them and creation, and as he exiled them from the tree of life and paradise. We may not be able to explain away suffering, but we Christians can confirm emphatically to all who suffer that God fully suffers with them. He suffers all the pain with humans. Many of us have watched a loved one suffer physical pain or emotional loss. It hurts us, and we want to rescue them if only we could. Imagine how God suffers that intensely, because his love for each human who suffers knows no bounds. God suffers from us, too. Think about when you were rejected in your life. It may have been a loved one who rejected your relationship and love. You may think of a time when someone simply said “No” to you. If you have been betrayed by a friend, you know how hurtful that is on all levels. We suffer from that. Harsh words, cold treatment, ostracism, gossip about us, etc., all hurt us. God who loves perfectly suffered from the rejections of humans from the first people to the millions today who say “No” to God. He has suffered through history, as people continually ignore and reject him. We push him away. We say lies about him and have done our best to exile him from our lives. The Creator suffers from how we treat each other. As Genesis tells us, each person is made in his image and likeness and is made for an eternal communion with him. God suffers from how those he loves cause each other pain and suffering. God suffered from the Abel’s blood that cried from the ground to him. “What have you done? Where is your brother?” God asks Cain. God suffers from our broken lives and relationships. Finally, God suffers for us. On the cross, God demonstrates his love for us by suffering and dying for us. Jesus became sin for us. He died for us. He took our infirmities and iniquities for us, so that we might be healed and be restored to eternal life with him. His suffering for us does not exempt us from suffering. It does, however, save us from eternal suffering of sin and death—if we say “Yes” to him. For God, has reaffirmed his resounding “Yes” to loving people on the cross. His perfect love requires the freedom for people to continue to say “No” to him, and many people do. Those who say “No” to the end will not be relieved or saved from their suffering. To know Christ, we share in his sufferings during the world’s history; that is not the whole story, though. We will also attain the resurrection of the dead, as we share in the power of his resurrection. This is the hope that we have. It is the same hope that and vision that inspired God’s creation of us—an eternal relationship with creature and Creator in paradise. One day, all that causes suffering will be removed from the people of God who enter into a new creation of God’s paradise where nothing evil will ever enter. All suffering, pain and tears will be wiped away! Without this hope, the suffering would be to no end and without a redeeming quality. The truth is that God’s suffering with us, from us and for us has an end in the renewal of all things and the destruction of evil, sin and death. This is way we can joyfully enter into the suffering of the Trinity, because we know that any present suffering we experience cannot compare to the glory to be revealed and experienced in God’s presence for eternity. Jesus’ prayer is that the very love between the Father and the Son may be in Jesus’ followers. This means his followers are to be included in the loving communion, the koinonia, of the Trinity. The glory of God and the Son is the self-sacrificial love that flows between them. Jesus prays that we might be in that love—in the Trinity. This is an unbelievable, indescribable privilege for a creature to become included in this eternal fellowship of the Creator. This is truly glory. This is why God suffers. This is why we must say “Yes” to him and follow him. That’s not all. We live this out according to Matthew 28:18-20, so that the world may believe and know that it is all true. We live as witnesses to God’s suffering in history and as prophets and priests unto God point to God’s glory in heaven and the future of the renewal of all things that is coming.